The picture of the Merciful Jesus has been one of the most well-known images of the crucified and risen Christ in the history of the Church and in the contemporary world. This is an unusual picture not only because of the fact that it is the most popular one but, above all, because the Lord Jesus Himself is its coauthor. On the 22th February, 1931, in a cell of the convent of the Congregation of the Sisters of Our Lady of Mercy in Płock, He appeared to Sister Faustina – she saw Him just as He is represented in the image and He commanded her to paint His picture according to the vision. She wrote about this in her ‚Diary’: In the evening, when I was in my cell I saw he Lord Jesus clothed in a white garment. One hand was raised in the gesture of blessing, the other was touching the garment at the breast. 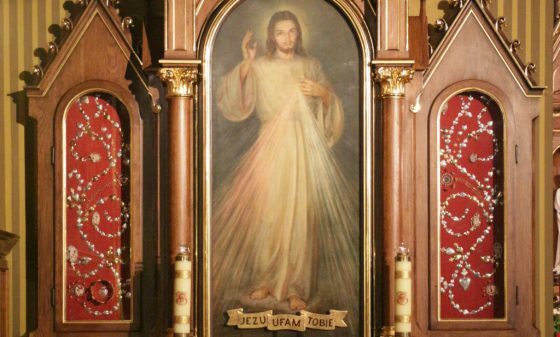 From beneath the garment, slightly drawn aside at the breast, there were emanating two large rays, one red, the other pale (…) After a while, Jesus said to me: ‚Paint an image according to the pattern you see: with the signature: Jesus, I trust in You’. I desire that this image be venerated, first in your chapel and [then] throughout the world (Diary 47).